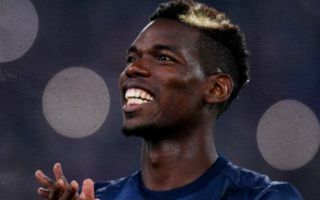 Manchester United star Paul Pogba sent a message of gratitude to his old club Juventus for the warm welcome from fans in Turin this evening. The France international spent four seasons at Juve between 2012 and 2016 before signing for United, and he was involved this evening as the Red Devils snatched a late winner away to the Serie A giants. Pogba has not always been at his best in a United shirt, but he was world class in his time in Italy, and it’s clear he’s still appreciated by the Juventus support. Several banners were visible paying tribute to the 25-year-old, and he admitted in his interview after the game that he appreciated the warm welcome. Many players get booed by their old clubs when they return with their new teams, but it says a lot about Pogba that he was able to leave Juventus for United and maintain a good reputation. United fans will now hope Pogba and co. can take something positive from this result and play with more confidence in the Champions League for the rest of the season.